Some 1600 years ago in a cave in the northeastern corner of modern-day Turkey, two wandering priests happened upon an icon of the Virgin Mary painted, so goes the legend, by none other than St. Luke. The priests, well, they did what priests tended to do in response to sacred revelations. They built a shrine right there at the craggy entrance to the cave. The shrine became a place of pilgrimage then did one better, becoming a flourishing Greek Orthodox monastery, one of the oldest in the world. Shelved on the sheer wall of Black Mountain, some 3900 feet above sea level, Sumela reached its apex during the Kemnenos Dynasty, in the 14th century. Back then, as many as 400 monks lived on the grounds, which included a cave chapel, library, and dormitories. Sumela remained active for well over a millennium, until 1916 and the occupation of Russian forces. With the institution of the Turkish republic in 1923, most Greek citizens were deported to the Peloponnesus, and the monastery was abandoned. A fire in 1930 and subsequent looting left Sumela in shambles. To get to Sumela today, you take the road from Macka through Altindere National Park until the mountain trek narrows to one lane, tree trunks the only guardrails. You have to park and hike the final few kilometers. The day I traveled to Sumela, the line of cars stretched a long ways. 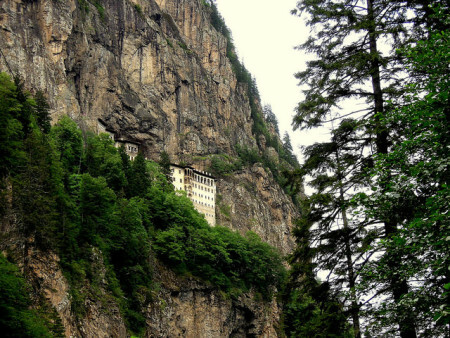 People streamed upward through towering trees until the monastery came into view. After decades of strict regulation over access to and usage of the monastery, the Turkish government has in recent years loosened its grip. First, it turned the site into a public museum. Then, in 2010, the Ecumenical Patriarch Bartholomew, head of the world’s Orthodox Christians, was allowed to officiate the first religious service in Sumela in nearly a century. Since that time, the Orthodox community has held mass once a year on the mountain on the 15th of August to commemorate Mary’s ascension into heaven. Beginning in 2012, the Turkish government also started restoring the site in earnest. Sumela now attracts tens of thousands of tourists and pilgrims annually. Large arches from an ancient aqueduct mark the entrance to Sumela. A stone stair leads to a slim gate, sufficiently wide for a single person to slide through. On the other side of the squeeze, the cave opens onto a modest stone village. Windows overlook a rushing river 300 meters below. Another steep stairway cascades down into the heart of the complex, to the grounds of the original church, with its still-bright frescoed exterior, Adam and Eve here, Jesus over there. 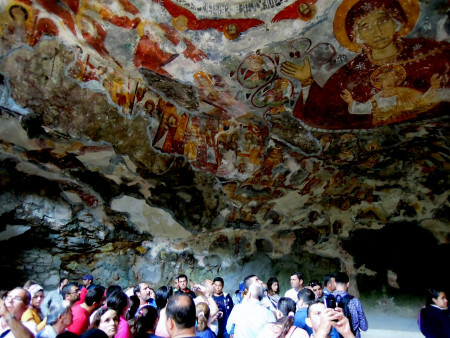 All around the monastery, the cave walls are decorated in religious graffiti. Clambering onlookers crane necks to take in the superfluous yet subtle beauty in the darkened grotto. Sumela is no Sistine Chapel. But the encircling art, however crude, overwhelms the senses all the same. Visitors to Sumela and the greater Black Sea region come for a number of reasons. Greeks and Russians appreciate the newfound freedom to see one of the holy places in their native religions. For Arabs and Turks, Sumela’s climate provides an oasis in the dessert. 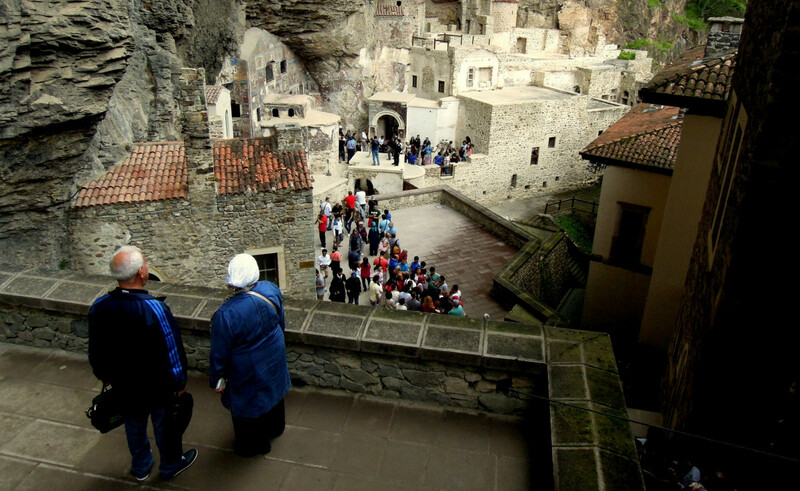 Turkish tourism companies offer what they call “green tours” of the Black Sea and the monastery. Nearby Trabzon offers lush forests, misty mountain trails, and mostly untouched beaches. The city also has some of the area’s best shopping, a world-class football club, and other historical sites including a small-scale Haggia Sophia. In our world of turbulence and war where religions and cultures seem increasingly unable to coexist peacefully, Sumela represents a different tack. Slowly the Muslim Turkish government has begun opening its doors and its coffers to the Greek Christian community. And slowly the ancient monastery of Sumela has begun attracting a new generation of pilgrims, saints, and explorers. Perhaps the cave on Black Mountain will remain a place of discovery, spiritual and otherwise, for centuries to come. Brian McKanna is an EthnoTraveler contributor.